PHILADELPHIA, PA--(Marketwire - Feb 1, 2012) - The Wells Fargo Center is synonymous with entertainment in Philadelphia and offers an oasis of activity ideal for planning a getaway for sporting events, concerts and family fun. Planning a break for 76ers basketball, the Flyers and NHL action, Villanova basketball, an upcoming Van Halen Concert or the Ringling Bros. and Barnum & Bailey® Circus is easy with nearby accommodations at distinctive boutique hotels in Philadelphia like the Renaissance. Conveniently located just a mile from the airport, and a premier choice among stylish Philadelphia Airport hotels, the Renaissance is an ideal hotel destination for taking in events at the Wells Fargo Center. As home to the Philadelphia 76ers Basketball and Flyers Hockey, Villanova College Wildcats men's basketball, the Wings Lacrosse and Soul Arena Football, there's always something happening to entice the excitement of dedicated sports fans. Concerts and special presentations are also plentiful, and the 2012 calendar is packed with events such as the Ringling Brothers and Barnum & Bailey Circus Dragons special, concerts by Van Halen, The Black Keys, Nickelback and Rammstein. Other upcoming events include performances by the Harlem Globetrotters, a WWE Raw Super Show and Michael Jackson The Immortal World Tour by Cirque du Soleil. Specific dates and details can be found at http://www.wellsfargocenterphilly.com. 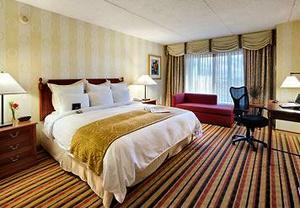 The Renaissance is also an excellent choice among hotels near Eagles Stadium, also known as Lincoln Financial Field, where 2012 events include the Brothers of the Sun Tour featuring Kenny Chesney and Tim McGraw and the always popular Advance Auto Parts Monster Jam featuring USHRA Monster Trucks. Accommodations at the Renaissance Philadelphia Airport Hotel include a variety of spacious guest rooms and hotel suites, all featuring plush bedding ensembles, marble bathrooms, room service, high speed Internet access, cable/satellite service with premium movie channels and pay-per-view movie options. For those seeking added amenities, the hotel also offers a concierge level for weekday lounge access and special hospitality services. Dining comes easy for Renaissance guests as The Sanctuary, a tantalizing choice among Philadelphia airport restaurants, is located inside the hotel and just steps from their door. Serving American classics and contemporary regional fare including succulent steaks, fresh seafood and pasta, The Sanctuary is open daily for breakfast, lunch and dinner. The Renaissance Philadelphia Airport Hotel welcomes travelers with gracious accommodations and exceptional service while providing an ideal location whether traveling to Philadelphia and the surrounding area for business or leisure. Complimentary shuttle service is offered to and from PHL Airport and the hotel offers airline reservation desks for the convenience of travelers. Other on-site amenities include a full-service business center and fitness facility along with a spectacular indoor atrium pool and whirlpool.